DIY History | Transcribe | Social Justice | I.C. 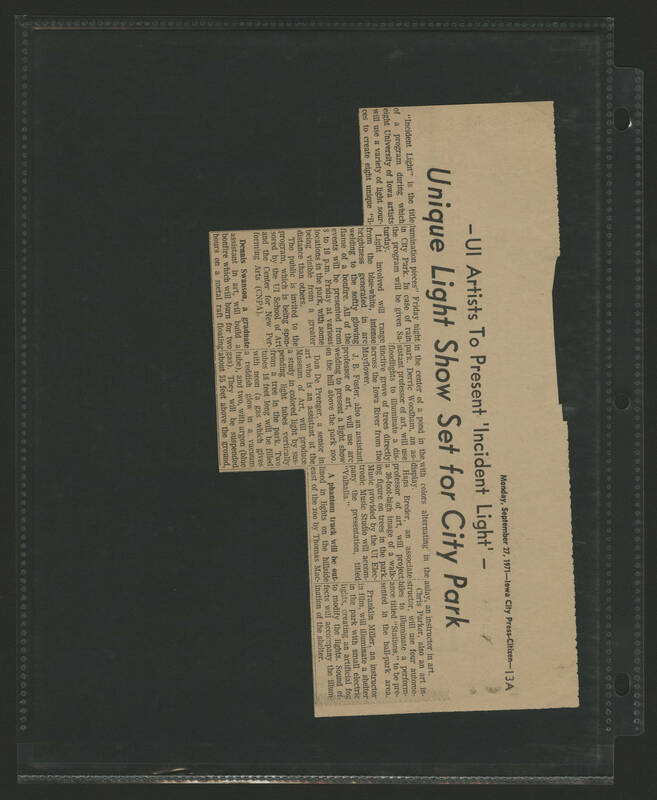 Notebooks 1 | 1971-09-27 ICPC Article ""Unique Light Show Set for City Park""
1971-09-27 ICPC Article ""Unique Light Show Set for City Park""
Monday, September 27, 1971- Iowa City Press- Citizen- 13A -UI Artists To Present "Incident Light"- Unique Light Show Set for City Park "Incident Light! is the title of a program during which eight University of Iowa artists will use a variety of light sources to create eight unique "illumination pieces" Friday night in the City Park. In case of rain the program will be given Saturday. Light involved will rage from the blue-white, intense brightness generated in arc welding to the softly glowing flame of a bonfire. All of the events will be presented from 8 to 10pm. Friday at various locations in the park, with some being visable from a greater distance than others. The public is invited to the program, which is being sponsored by the UI School of Art and the Center for New Performing Arts (CNPA). Dennis Swanson, a graduate assistant in art, will build a bonfire which will burn for two hours on metal raft floating in the center of a pond in the park. Derric Woodham, an assistant professor of art, will use floodlights to illuminate a distintctive grove of trees directly across the Iowa River from the Mayflower. J.B. Foster, also an assistant professor of art, will use arc welding to present a light show on the hill above the park zoo. Dan De Prenger, a senior in art who is an assistant to the Museum of Art, will producde a study in colored light by suspending light tubes vertically from a tree in the park. Two tubes 18 feet long will be filled with neon (a gas which gives a reddish glow in a vacuum tube), and two, with argon (blue gas). They will be suspended about 25 feet above the ground, with colors alternating in the display. Hans Breder, an associate professor of art, will project a 30-foot-high image of a walking figure on the trees in the park. Music provided by the UI Electronic Music Studio will accompany the presentation, titled "Valhalla". A phantom truck will be outlined in lights on the hillside east of the zoo by Thomas Macaulay, an instructor in art. Chris Parker, also an art instructor, will use an art inbiles to illuminate a performance titled "Stations" to be presented in the ball-park area. Franklin Miller, an instructor in film, will illuminate a shelter in the park with small electric lights, creating an artificial fog to modify the lights. Sound effects will accompany the illumination of the shelter.